Oh. Tank you so moooooosche. I was looking for an ex-fol-ee-ay-shons. Redonk, Stephanie P. Totally redonk. That must be how the wale got so white—he's soooo cleans. Mmm...what a fine day at the seaworld spa! ah ha ha!! so cute!!!! Adorable picture and great headline! Brusha, brusha, brusha indeed! Looks like interspecies snorgling to me. ooh, cetacean affections! sho vewwy wefweshing! wuvvin' dems!! "You almost make me forget mah bukkit." Is that a baaaayyy-beeee be-looooo-ga? I love the way it looks like it's smiling. Megs - LOVE the pop-up comment!!!! And it does indeed look like a Beelooooooga!!! I bet those whiskers tickle!!! PS Isn't there a saying about "A kiss without a mustache is like something or other"? Oh my GAWSH. I MUST know where this picture was taken. I'm going there and getting a job. Seriously. My mom took her second grade class to the aquarium, and one of the little girls wrote later, "I didn't like it when the seal kissed me." Ungrateful wretch! Definitely a beluga whale and a walrus...think Smooshi of Smooshi and Phil. lookit how the top of the beluga's marine schnozzle is so smoooooth...me thinks i need my own walrus-dayspa to halps me with my exfoliatingks. I hear that a walrus facial scrubbing is found only at the finest of spas. Dammit, Lori, you beat me to the beluga neck wrinkles! I'm sorry Gerald, it will never work, we're different species. that is adorable! i want to see more! 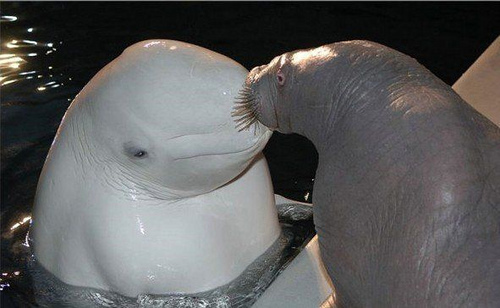 any idea where this was taken so that we might all see MORE of the Beluga/Walrus Luvin? He's all squeeeesshy! I bet those whiskers tickle too. Beluga beauty also wants spa help for the wrinkies around his neck. Lolrus: "Opnez yur mouf! I know ma bukkit's in dere!!" I'm not sure either of these bubba's are cute by themselves. But that smack just sends them to the stratosphere of cute. I wish I had a walrus to snorgle me each morning. Nothing like fishy walrus love. I would even give him/her 7 blue buckets, one for each day and filled to the brim with the tastiest fish available. K? But are walruses and belugas friends in the wild or, like cats and raccoons, are they enemies? That is totally the cutest thing I have ever seen on CO! I agree with Clare, a little :interspecies snorgling" is nice to see sometimes. Do you suppose the walrus is really looking for feeshies though..??? Stop it. Seriously. This is too much. One day I vow to also kiss a beluga. I swears. That is too cute. I also would like more info about these two luvers. on my goodnessishness! i must have some ex-fol-ee-ay shuns too! luv it! Ok the preschool teacher in me says......Baby Beluga, baby beluga...thanks Meg!!! I had a really bad dream about beached killer whales and belugas and a shark with a silly name. So this pic makes me feel muuuuuch better. Yay! SEALED with a kiss! Or should that be WALRUSED? SQUEEEEEEEE!!! A beluga and a walrus together in a pic! I can haz CPR nao? Kthxbai.